If you have come to experience Talking Heads . . . This Must Be The Place. 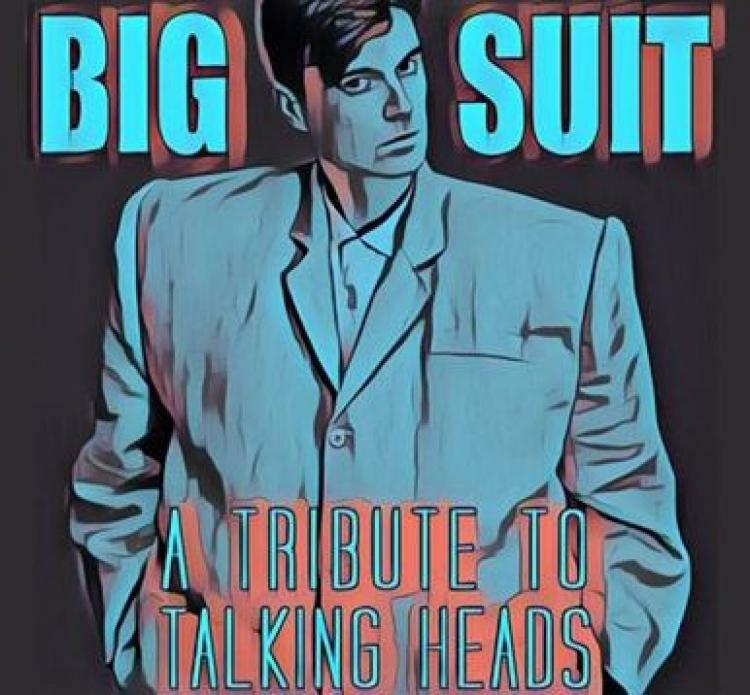 BiG SUiT is a collective of nine musicians drawn to the cerebral adventures, infectious rhythms, and pioneering music known to the world as Talking Heads. BiG SUiT began when a Chicago-area producer reached out to Deacon Blues founder Steve Kikoen with a request to form a Tribute to Talking Heads. With enormous respect and admiration for David Byrne, Tina Weymouth, Chris Franz and Jerry Harrison, the idea of forming a tribute to these musical innovators was intriguing. Steve proceeded to put together what has ultimately become an amazing replication of Talking Heads. BiG SUiT, inspired by the seminal Jonathan Demme/Talking Heads film “Stop Making Sense,” is additionally dedicated to all ancillary forms of the Heads, including the David Byrne & St. Vincent (Annie Clark) collaboration, as well as connections to Peter Gabriel, Afro Celt Sound System, and WOMAD (Gabriel’s World of Music, Arts, and Dance) institution. Frontman Jason Krause brings an astonishing take on David Byrne. From the eye-catching and flamboyant routines of dancer/singers Jennifer Hall & Jessica Hornsten to the incredible percussion and afro-celt rhythm section of Phil Brines, Janis Wallin, and Megan Thomas, this Tribute to Talking Heads is the real deal. Rounding out the personnel are Paul Mutzabaugh & Cash Michaels on keyboards and EWI (Electronic Wind Instrument) respectively; with all of the “SUiTS” under the direction of Steve Kikoen, guitarist for BiG SUiT and founder/guitarist/singer of Deacon Blues. This funk–rock ensemble of stellar musicians offers up a truly inspirational, “Once In A Lifetime” connection.